We hate to break it to you, but time-travel isn't possible. Bygone eras are just that: gone. And until Rick and Morty step through a portal into our offices, we will continue reinforcing that fact. We must remember this fact, for our costumes are at stake! 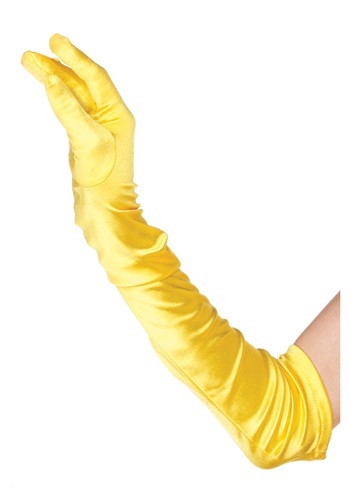 We must also remember that costumes will always and forever allow us to bridge that temporal gap, making it entirely possible for you to experience, say, those iconic Roaring 20s in, say, these bright yellow gloves. Anything the Jazz Age throws at you, be it overzealous dudes who say "old sport" too often, an epic swing dance-off, or a little too much champagne, or whatever, you'll be ready to hold them close, push them away, or hold that bottle by the neck in style. Enjoy the 20s, dear—and let us know when you're ready for another era. Horrible quality! Finger popped through the end after 30 minutes.